Everything bagel salmon is the star of a perfect quick and easy weeknight meal! 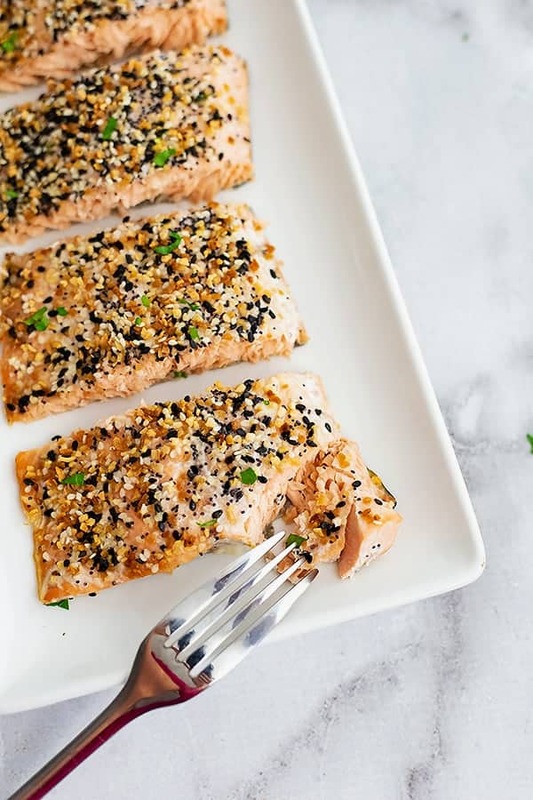 Ready in 15 minutes, this recipe for everything bagel salmon is gluten free, paleo, keto and Whole30 friendly! Perfect for weeknight meals or even entertaining! I have been buying jars of Everything But the Bagel seasoning at Trader Joe’s for months. Usually I add it to my eggs and avocado in the morning and love the fun flavor it gives. If you haven’t heard of it before, it’s the spice blend that is used to season the “Everything bagel”. What is everything bagel seasoning? 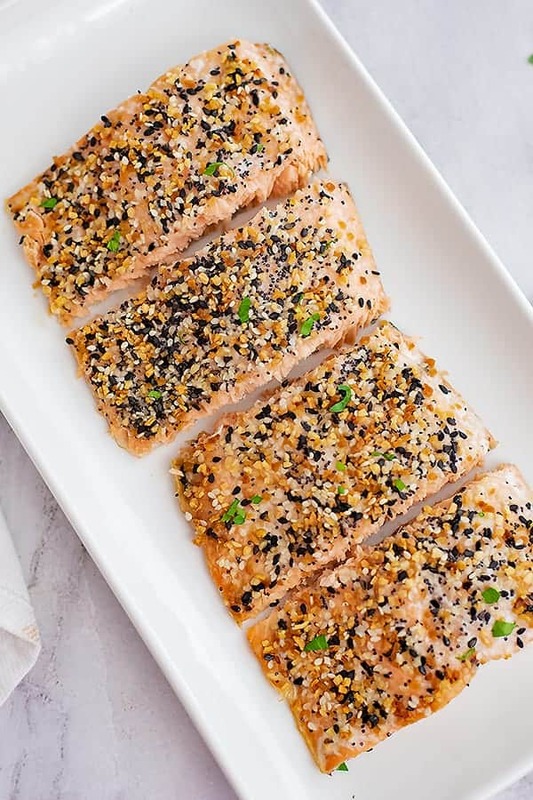 The crunchy salt paired with the sesame seeds and chunks of dried garlic and onion add a distinct flavor that pairs perfectly with any savory dish! Add the salmon fillets to the baking sheet and top with thick coating of everything bagel seasoning (about 2 tablespoons). If you are adding a veggie, place the vegetable on the baking sheet as well and sprinkle with salt. Bake at 450F for 12 minutes. What vegetable can you roast with everything bagel salmon? 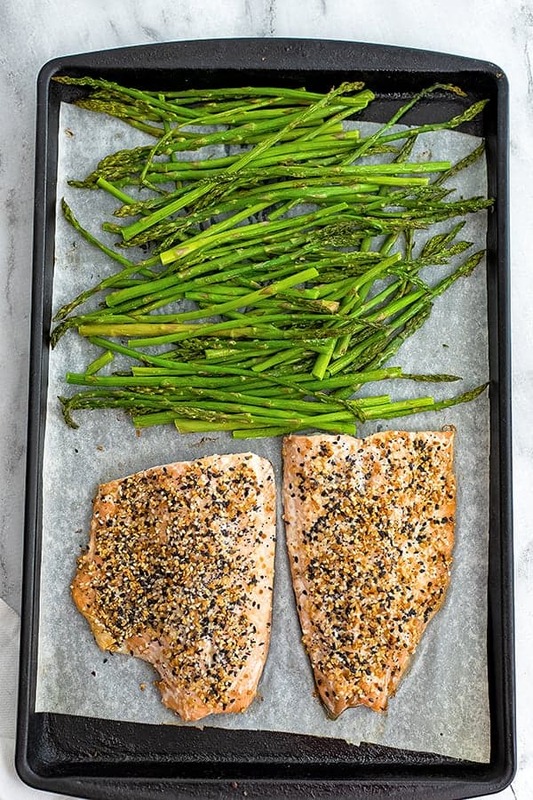 Since the salmon is only in the oven for about 12 minutes, you will want to choose a quick cooking vegetable. Cooking salmon can seem intimidating but I promise you it’s a very forgiving fish to cook with. It is important to start with fresh fish. A good rule of thumb is to try to cook your fresh salmon within 48 hours of buying it. If you need it later in the week, freeze it immediately when you get home and defrost it the day before cooking. This everything bagel salmon recipe cooks completely in the oven and you don’t have to worry about flipping it or trying to get the skin crispy. 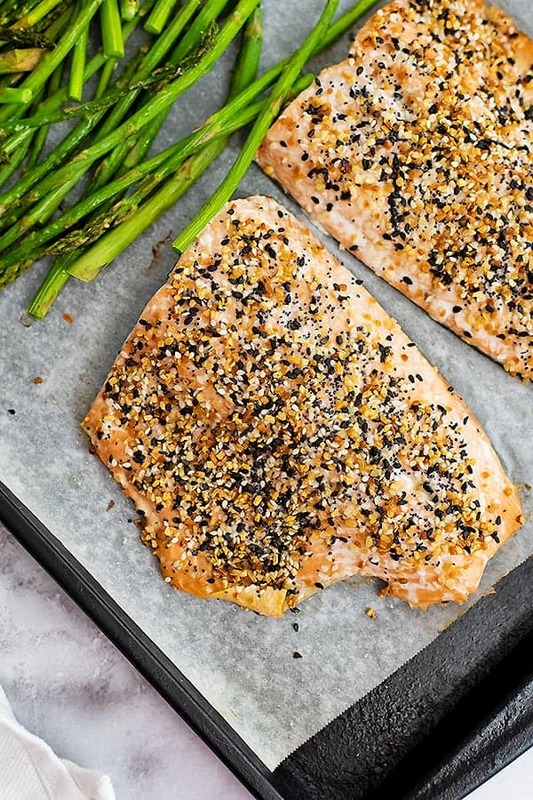 If crispy skin is your thing, I do have a recipe for simple 7 minute salmon that starts on the stove and ends under the broiler that you could try this recipe with. TIP: Wait to add the everything bagel seasoning until after broiling or it will burn. How to know the salmon is cooked? Press down on the thickest part of the salmon and you should notice that it starts to break apart easily. 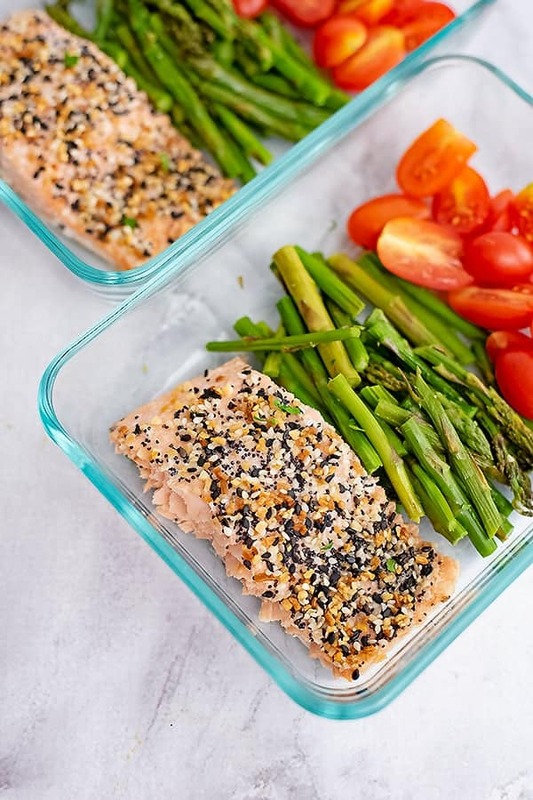 If there is a lot of resistance and doesn’t flake, the salmon likely isn’t cooked all the way though and may need an additional minute or two. How to remove the skin from the salmon? 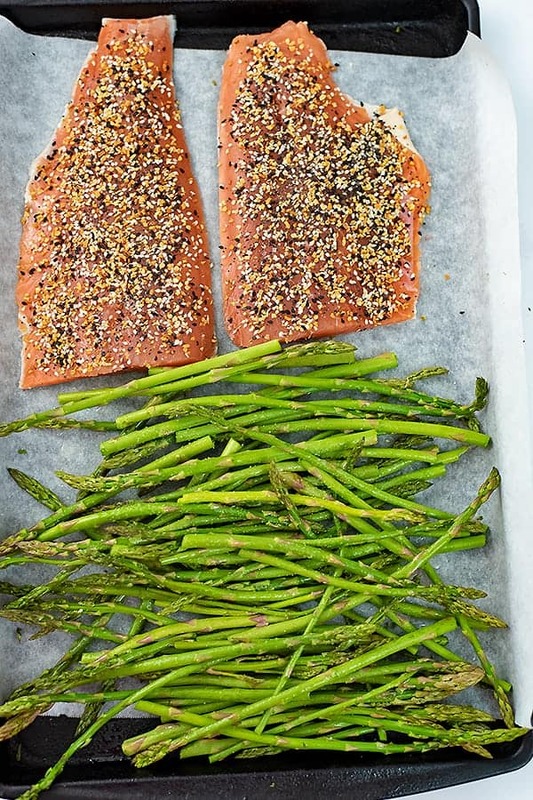 Salmon skin can easily be removed from the salmon filet after cooking by simply peeling it off. You can also leave the skin on and just flake the fish away from the skin as you eat. 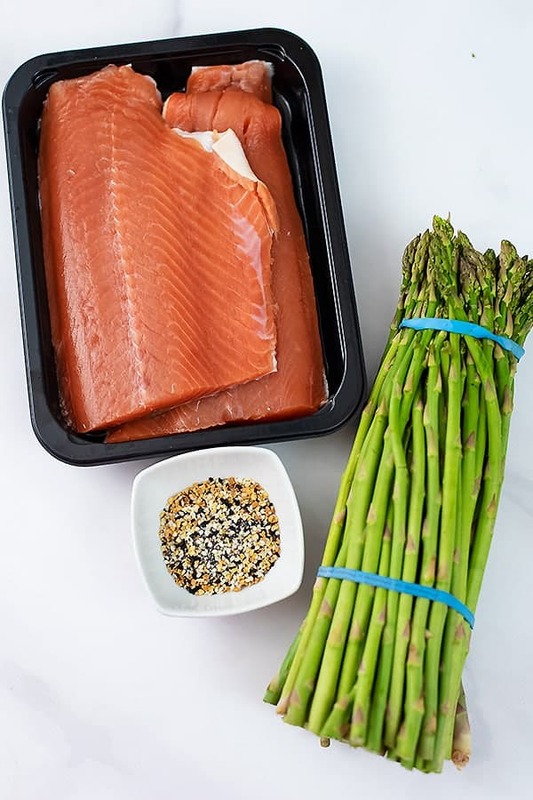 What to serve with Everything Bagel Salmon? Add parchment paper or silicone liner to a baking sheet. Spray lightly with non-stick spray. Add the asparagus spears to the baking sheet. Be sure to trim away the tough ends of the asparagus. Sprinkle with salt. Bake in a 450F oven for 12 minutes.